140 families of a highrise residential complex in south Mumbai, whose homes were set to be demolished, got some relief from the Supreme Court on 2nd May, 2013. The top court stayed the demolition and gave the flat-owners five months to vacate. 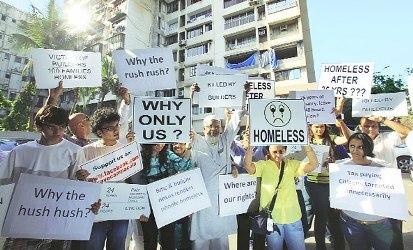 The Campa Cola Compound in posh Worli had been the scene of a massive protest, with the civic authorities expected to start the demolition under heavy police presence. Hundreds of residents formed a human chain to block entry to the complex. The gates of the compound were shut and women squatted outside. School children too joined the protests. Seven highrises were constructed at the Campa Cola Compound between 1981 and 1989. The builders had permission for only six floors, but constructed way too many. Mumbai’s civic body had decided to bring down the 35 illegal floors in the seven highrises after the Supreme Court, in an earlier order, refused to regularise them. Milind Deora, the Congress MP from Mumbai (South) had taken up the residents’ cause and had impressed upon the Chief Minister and Municipal commissioner of Mumbai to give the residents more time before the demolitions take place. 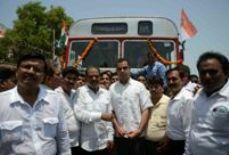 Flagged off BEST’s bus service to/from Geeta Nagar ,Colaba, a long pending demand of locals on 10th May, 2013. South Mumbai citizen’s met Milind Deora and submitted an aide-memorie on the lack of implementation of government policy and recommendations by several citizen’s groups on radiation from mobile phone towers. In a meeting with Dr.Toure (ITU) discussing global telecom issues and regulations on 7th May, 2013 at Sanchar bhawan, New Delhi. Chairing a meeting to resolve long pending issues between tenants residing on Mumbai Port Trust land & Ministry of Shiping officials on 6th May, 2013 at Transport Bhawan, New Delhi. 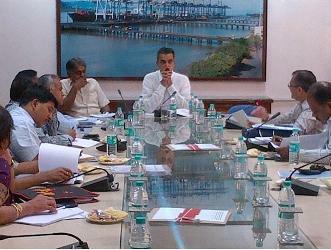 Discussing with the representatives of various shipping companies of India to explore the opportunities for growing Indian shipping and tonnage on 2nd May, 2013.